To unlock this game feature, progress through the game until Chopper pops out to give you a simple tutorial on how to Discover Skills for your protagonist and crew members. Discovering skills will give your crew more fire power and advantage over your enemies. refer below to learn more. to enhance or discover a new skill for your crew member. 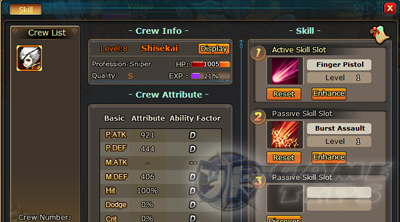 - Open "Crew" panel and click "Discover" button on the "Skill" interface. - You character/s will randomly get a skill from their specific profession. - To view all skills per profession, click the scroll like icon (upper right corner). - To check if you have more points to spend, check the "Remaining Points" below it. free skill point to use. conditions before his or her turn. - While in battle, move your mouse over your characters to view their current stats and more. Refer to the sample character portrait above. - Red bar shows your character's current HP. - Fury is used to unleash skills!, each skill requires a certain number of Fury. - Regenerates over time or after a turn while in battle. - Crew with available Fury and skill will have a shining aura around them.